Wood modification includes all measures that increase the durability and dimensional stability of wood. The different methods (thermal, mechanical, chemical treatment) reduce swelling and shrinking of the wood and provide extensive resistance against fungus infestation. Modified wood with high dimensional stability, classified in durability class 1, multi-glued with PU adhesive as a standard, available as pure Accoya® or combined with other wood species. Accoya® cover plies with a thickness of at least 22 mm, falling structure, strong colour variations batten stripes that are typical for Accoya® cannot be excluded and do not justify complaints; suitable for opaque coating (outdoors!) Accsys recommends all parts, such as screws and hardware, that have contact with the wood and the remaining vinegar acid in the wood are made of stainless steel. The plies are glued with PU adhesive; no finish planing is applied after gluing. (PU adhesive might escape at the edges!) 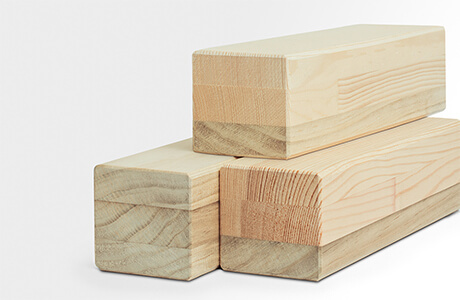 Available as pure Accoya® scantling or combined with pine or spruce, in rifts/half rifts. Also available with FSC™ certificate! Accoya® cover plies with a thickness of at least 22 mm, falling structure, strong colour variations and batten stripes that are typical for Accoya® cannot be excluded and do not justify complaints; suitable for opaque coating (outdoors!) Accsys recommends all parts, such as screws and hardware, that have contact with the wood and the remaining vinegar acid in the wood are made of stainless steel. The plies are glued with PU adhesive; no finish planing is applied after gluing. (PU adhesive might escape at the edges!) Available as pure Accoya® scantling or combined with pine or spruce, in rifts/half rifts. Also available with PEFC™ certificate!